The ultimate gift box to put the signature Neuhaus Belgian chocolates in the spotlight. 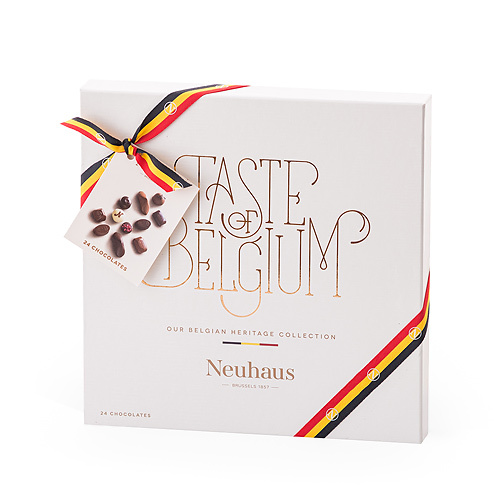 The Taste of Belgium is a unique tasting experience that will guide you through Belgian history and the chocolate-making expertise of Neuhaus. 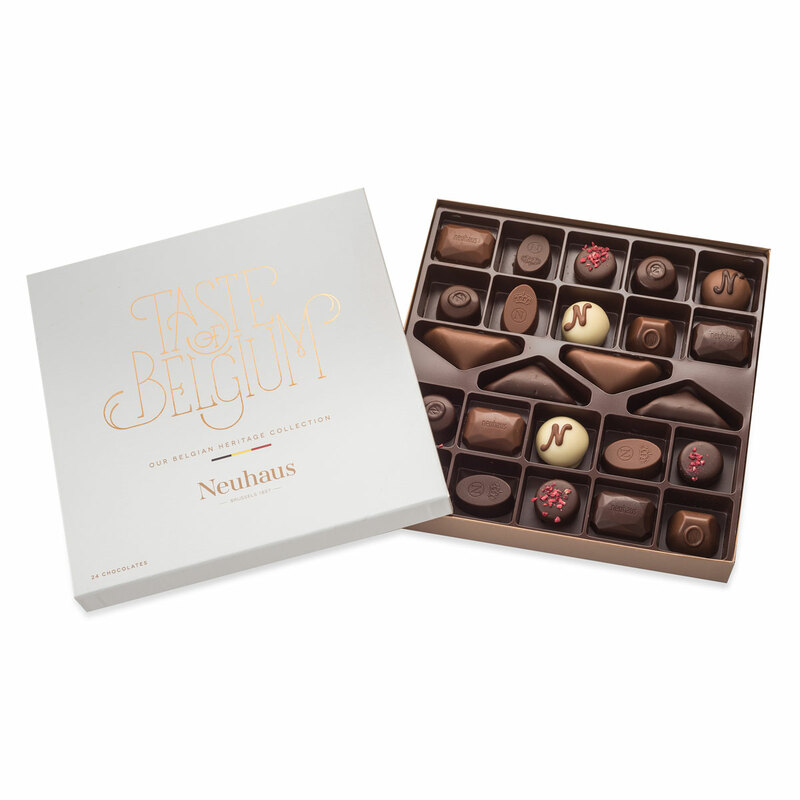 Indulge in the handmade Irrésistibles, the Manons, and other legendary Neuhaus pralines. Ingredients: Sugar, cocoa mass, whole milk powder, cocoa butter, roasted hazelnuts, butter (contains milk), glucose syrup, roasted almonds, cream (contains milk), palm oil, honey, butter oil (contains milk), stabilizer: sorbitol of wheat, palm kernel oil, butter biscuit (wheat-flour, sugar, butter (contains milk ), egg, wheatstarch, salt, raising agent: ammonium bicarbonate) , stabilizer: glycerol of rapeseed, coconut oil, sunflower oil, emulsifier: soy lecithin, coffee, flavours, raspberries, freeze-dried raspberry pieces, fructose glucose syrup, rapeseed oil, apple purée, dextrose, salt, wheat-flour, skimmed milk powder, potato starch, caramel (caramelized sugar), thickener: guar gum, xanthan gum, invert sugar, vanilla, enzyme: invertase, corn oil, elderberry, egg white, malt flour (wheat), acidity regulator: malic acid, acid (citric acid), emulsifier: sunflower lecithin, skimmed cocoa powder, raising agent: sodium bicarbonate, wheatstarch, spices.